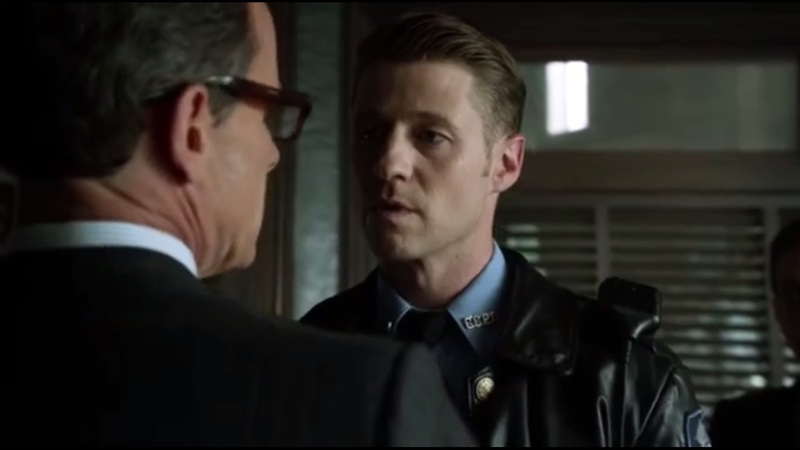 A Look at Gotham- Season 2 Premiere: “Rise of the Villains: Damned If You Do…” | What Else is on Now? 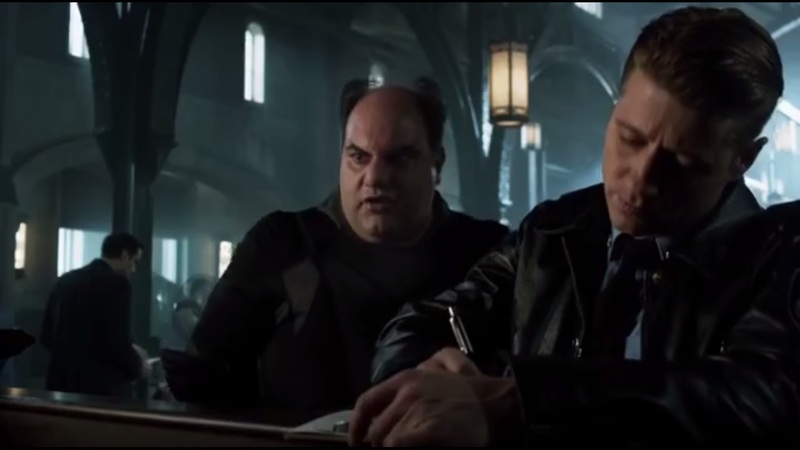 Sure, it was Gotham City and showcased a young James Gordon coming in to clean up the corruption and a host of early versions of Batman’s rogues gallery, most notably Robin Lord Taylor’s interpretation of Oswald Cobblepot. However, the show, particularly the first half, I felt was muddled by shoddy writing, repetitive characterization and plot points, implementing too many villains than necessary, and an overall uneven tone compared to the likes of Flash, Arrow, Agent Carter, Daredevil, and other comic based shows. The bad outweighed what good there was and I’ve been skeptical of what a second season could offer, particularly with this whole “Rise of the Villains” angle we’ve seen in promotions leading up to the premiere. Is this an improvement over last year’s premiere? Let’s dive right in. The season begins one month after the events of the previous season. Bruce and Alfred head down the hidden staircase, but stop when they arrive at a door. Bruce tries a number of combinations on the keypad, but no luck. As Lou Reed’s Perfect Day plays, an obvious sign of great things to come, we see Leslie help Jim get ready for the day. 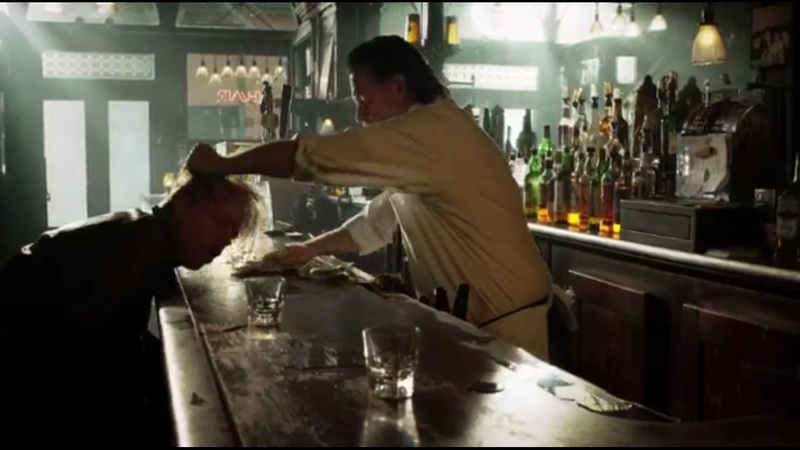 Bullock cleans up at the bar. And Penguin continues his reign as the King of Gotham, while having Zsasz off a man in the process. Oh, and Barbara moves into Arkham since there was no place left to put her. 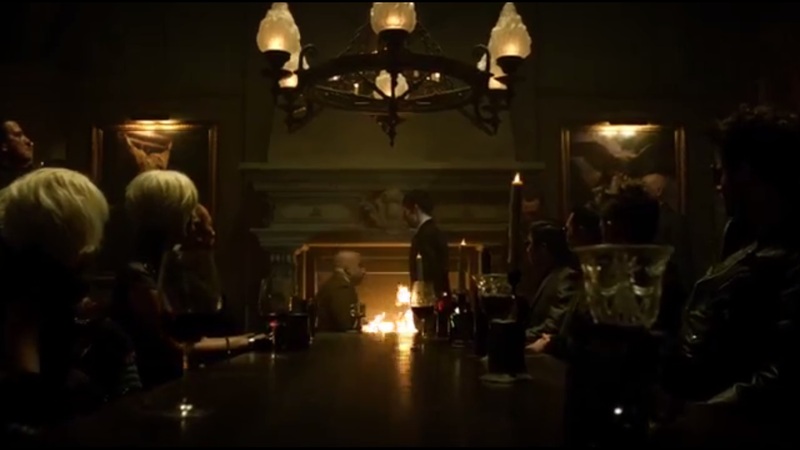 We end this montage with a man being handed a drink from an unknown figure. 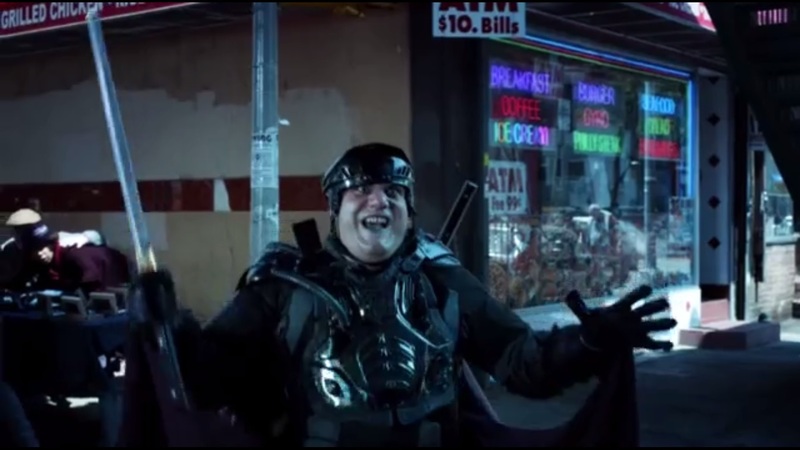 But for now, as we cut to the next day, we see the drinker, Zaardon the Soul Reaper, played by David Fierro, heading out to cause havoc in Gotham. Luckily, Traffic Cop Gordon is there to take him down before he can harm his hostage. If only Gordon’s new partner, Franks, played by Michael Barra, had been around earlier. 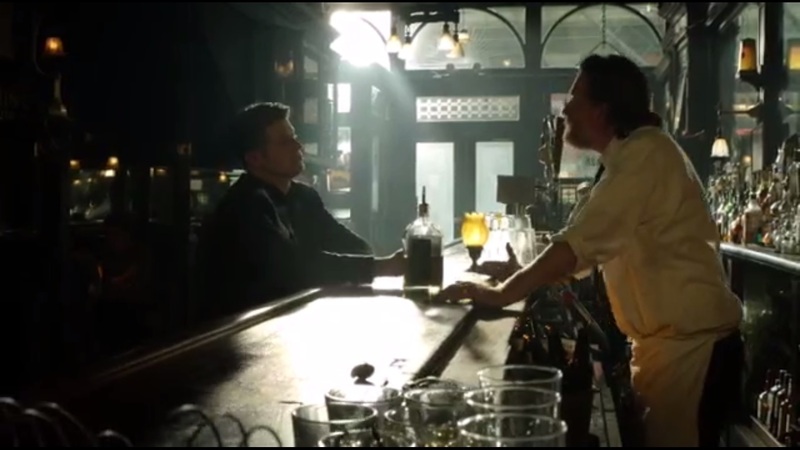 At GCPD, Zaardon fills Gordon in that he drank dragon’s blood from the master’s chalice. Gordon may have won the battle, but the war has just begun because the Master will soon unleash hell upon Gordon. Dark days are coming. Right. 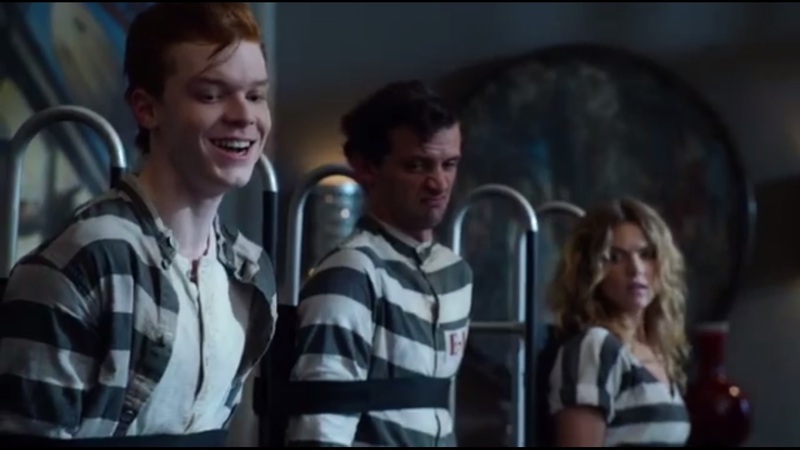 Gordon heads to the locker room so we can get a brief reintroduction to Nygma, who is still unhinged from last season. 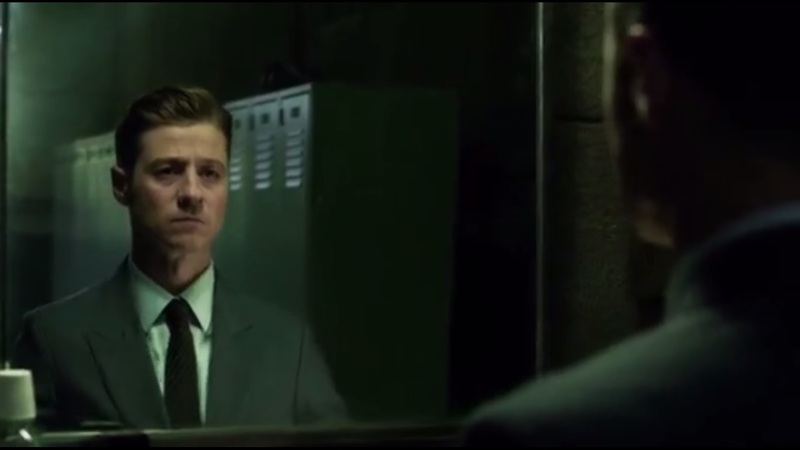 But now he’s pulling a Norman Osborn and talking to himself in the mirror. 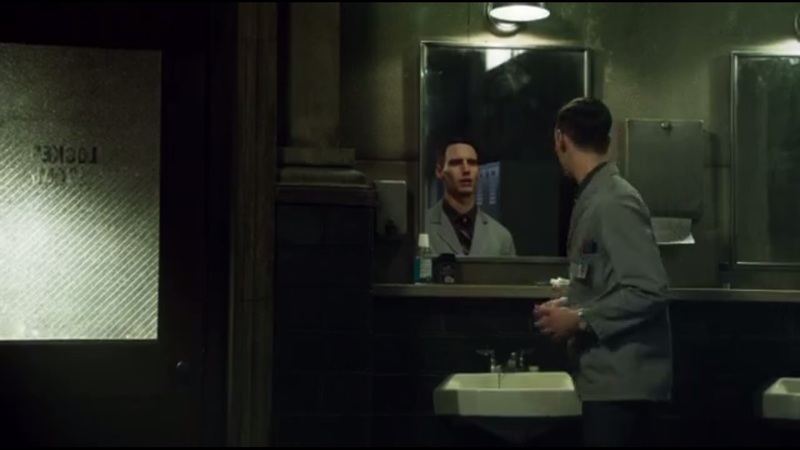 Mirror Nygma thinks that real Nygma needs some love and romance in his life. 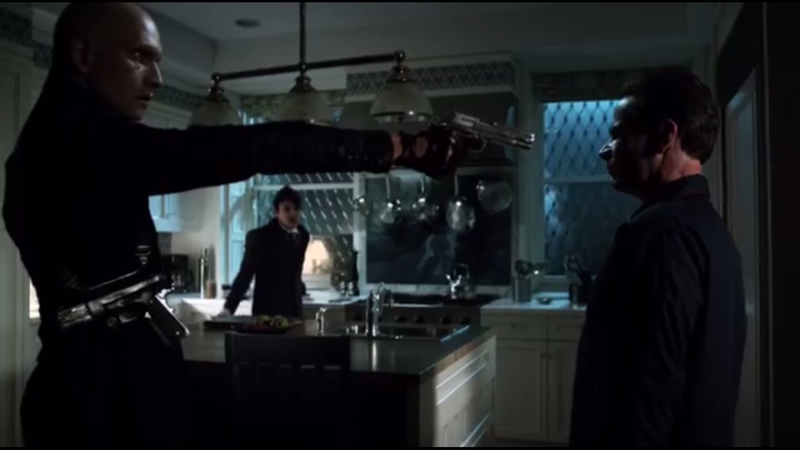 Real Nygma demands that Mirror Nygma leave Miss Kringle alone. Commissioner Loeb summons Gordon because he put his hands on Officer Franks. Really, it didn’t even constitute a shove, but this being Loeb, he’ll take any opportunity to nail Gordon to the wall. Demoting Gordon hasn’t lowered his spirits or made him quit, as it did Bullock, but his actions call for an immediate and mandatory dismissal. Essen doesn’t stand for this and sticks up for Gordon, saying that he deserves a commendation. Loeb tells her to take Gordon’s badge and gun, but he hands it in himself. He also shakes Loeb’s hand, to the commissioner’s surprise. Gordon promised to break Loeb and he intends to follow through on that. How foreboding. 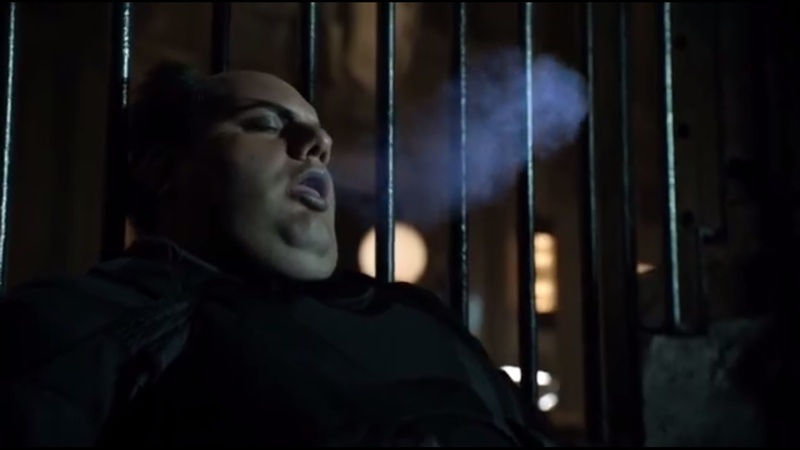 Zaardon sleeps in his holding cell, all while emitting smoke from his mouth. That could be a problem. That evening, Jim fills Leslie in on his confrontation with Loeb. She thinks it may be for the best that Jim isn’t on the force anymore. Jim concedes that he could have just walked away, but he hates to quit. Though Leslie points out that he didn’t quit, he was fired. Thanks, Leslie. Clarification received. Even still, she knows that Jim won’t quit because he’s a cop. 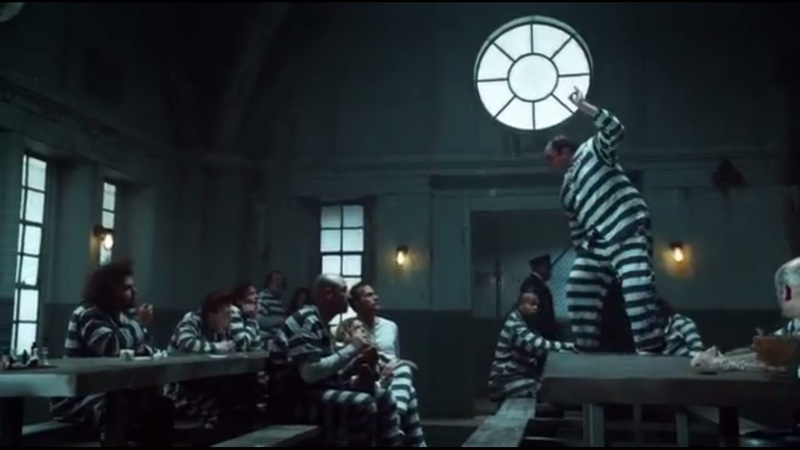 Back at Arkham, which presumably does not have separate wings for women, Jerome slides in on Barbara’s territory and the two learn why they’re both incarcerated. 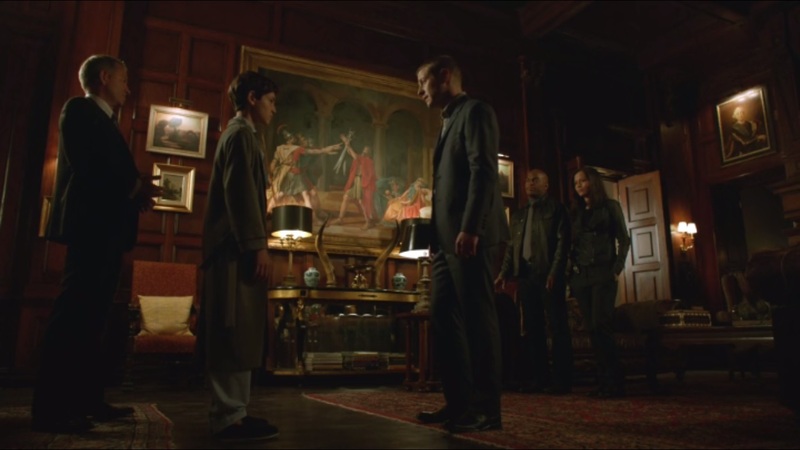 In addition, Jerome lets Barbara know that he has a powerful ally in the name of Richard Sionis. You remember Black Mask from the first season. Guy who wore a goofy mask, killed 25 people? Well, he’s got a thing for Barbara. 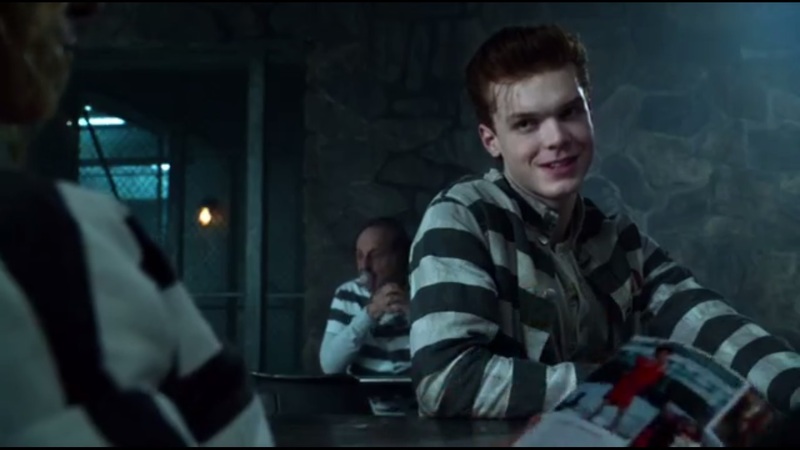 And in Arkham, when guards don’t pay much attention to the bad things that happen to inmates, everyone needs friends. So Barbara enlists one roommate to be her friend and protect her from people that may try to hurt her. The inmate agrees. Even still, Jerome has connections with people who can get things that others can’t. That’s good, because Barbara needs a phone right now. As Butch goes over information regarding one Ogden Barker and his $70,000 debt to Falcone, a henchman informs Penguin that Jim has arrived so the two can talk. Oswald is glad to see his old friend and orders everyone out of the room. Despite this, Selina stays. Yeah, Selina’s siding with Penguin now for some reason, but Penguin doesn’t mind. It’s like having a cat around the house, he says. 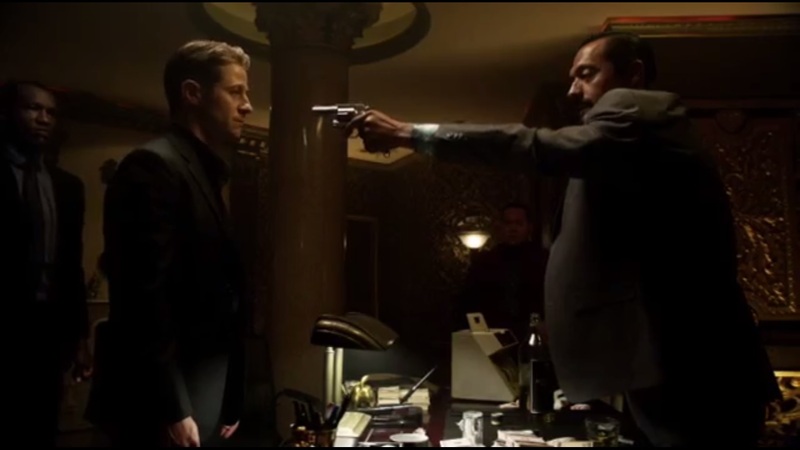 So Jim reminds Penguin that he’s owed a favor since he saved him from Maroni’s men. Yes, Jim arrested Oswald in the first place, but that was for attempted murder. Without hearing the request, Penguin agrees, figuring that Jim wants Loeb fired and his old job back. It can be done, though Oswald doesn’t see why Jim wants this. After all, police work in Gotham is a thankless job. Penguin has a favor as well in relation to Ogden Barker. He wants Jim to talk to him, though Jim figures that he’s being used as a debt collector. This is to prove that their friendship is real and based on trust. Jim doesn’t agree to the terms and leaves. We then cut to a hammered Jim boozing his troubles away at Bullock’s bar. Now Bullock would have no problem with Penguin’s terms, but he knows that Jim, moralist that he is, would never willingly work for Penguin. Bullock’s doing well for himself. He’s been sober for 32 days now, has a woman that likes him, and a nice place. Life has been easy since quitting the force. Jim takes a long walk to Wayne Manor to inform Bruce and Alfred that because he’s been fired, he won’t be able to fulfill his promise of finding the Waynes’ murderer. He does, however, tell the two that he can keep his job by doing Penguin’s dirty work. Bruce realizes this is a demeaning task for Gordon, who made a vow to change Gotham, but must do ugly things that go against his honor. So Jim isn’t sacrificing for the greater good just to keep his dignity. Sometimes, Bruce says, the right way is the ugly way. Alfred calls Bruce out of line for this. After all, Bruce is just a kid and can’t understand what Jim’s experiencing right now. True, but Jim did walk all the way to Wayne Manor, so he can handle a little scrutiny. 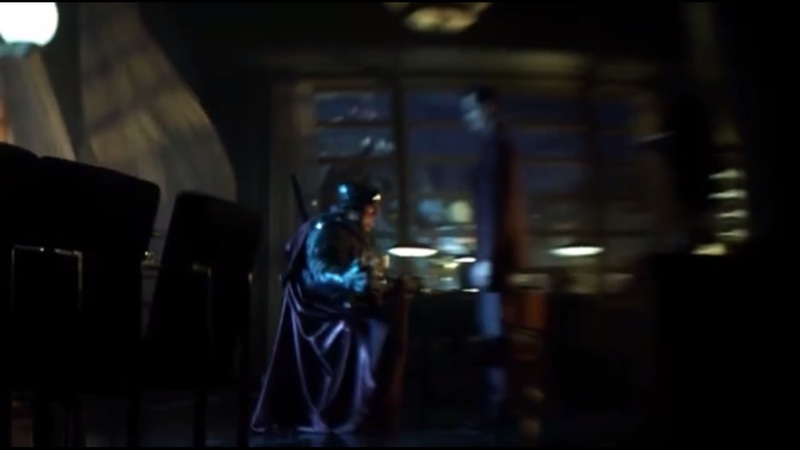 Bruce apologizes and goes back down the hidden staircase to take out some anger on the still locked door. After more combinations don’t work, Bruce takes a hammer to the pad and smashes it. Barbara speaks with Richard Sionis, who can indeed help Barbara, but that all depends on how much she wants what she wants. 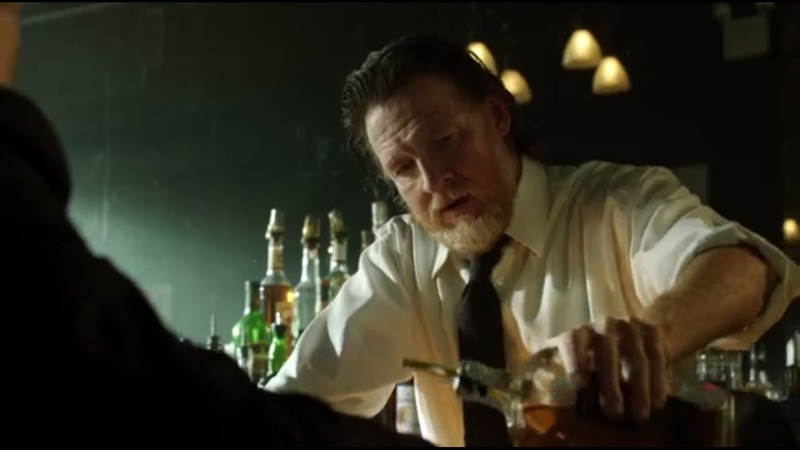 Gordon does indeed head to a club to meet with Ogden Barker, played by Otto Sanchez, who refuses to pay his debt because that’s owed to Falcone, who isn’t in Gotham anymore. Gordon manages to overpower Ogden’s bodyguards and get the money, but once he heads out into an alley, he’s then pursued by cops as well as Ogden’s men. Soon, Gordon winds up in a parking garage. He’s almost in the clear, but Ogden fires at him. Gordon fires back and manages to kill Ogden in the process. Whoops. 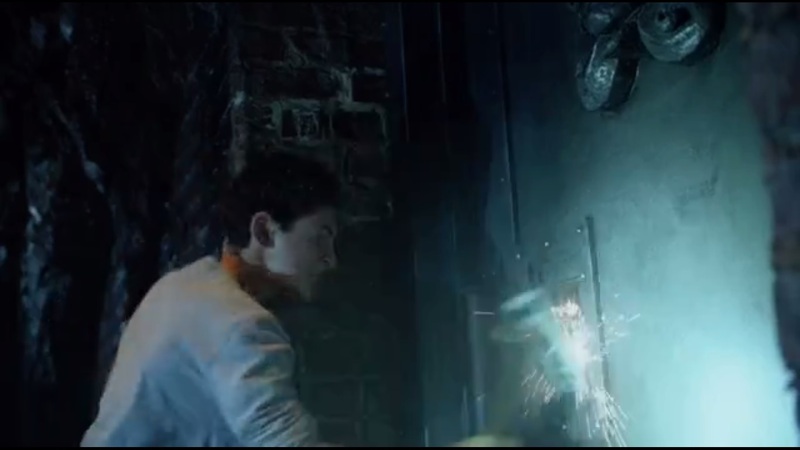 So because a hammer couldn’t open the door, Bruce’s next step is to gather fertilizer to make a bomb. Alfred, naturally, is against this ugly plan, but hey, Bruce has read a book on bomb-making. A book. 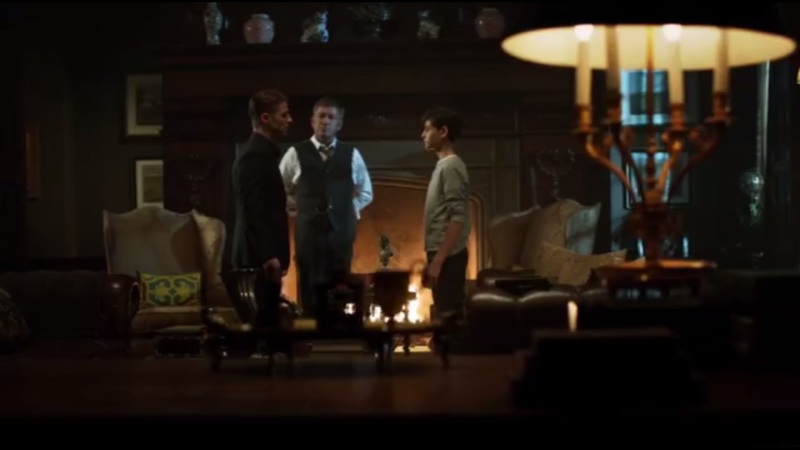 Alfred warns Bruce that he may not be ready to find out what’s behind that door or what his father may have been up to, but Bruce continues anyway. And Alfred goes along with the plan anyway. Gordon turns over Ogden’s debt to Penguin, who might have known that Ogden would react the way that he did. Later, Leslie senses that something is off with Gordon, who receives a phone call from, who else, Barbara. 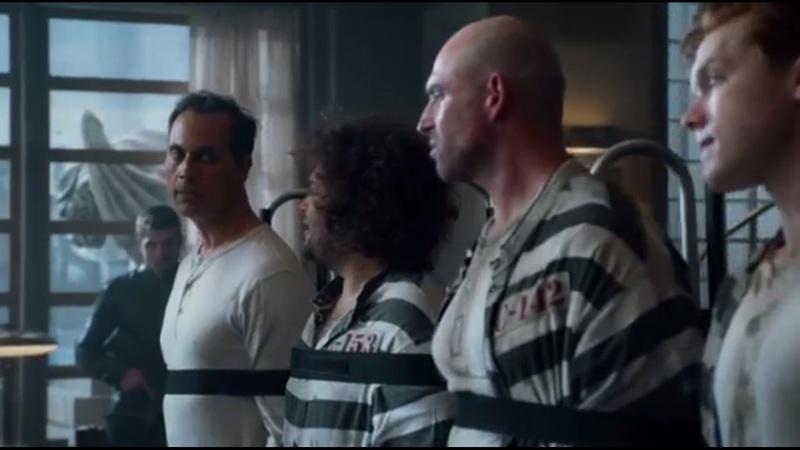 It certainly took no time to get a telephone into Arkham. 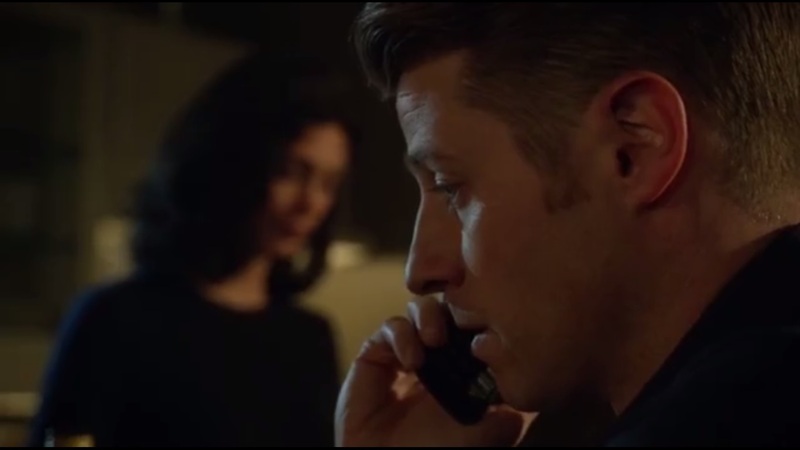 She can’t stand being at Arkham and tells Jim that this is all one big mistake. She never told Leslie that she killed her parents. Hell, Leslie is the one who attacked her first! Jim hangs up, telling Leslie that it was just a sales call, but then Barbara calls Leslie’s landline phone, because Leslie might be one of the few people who still has one. Anyway, she leaves a threatening voice mail. 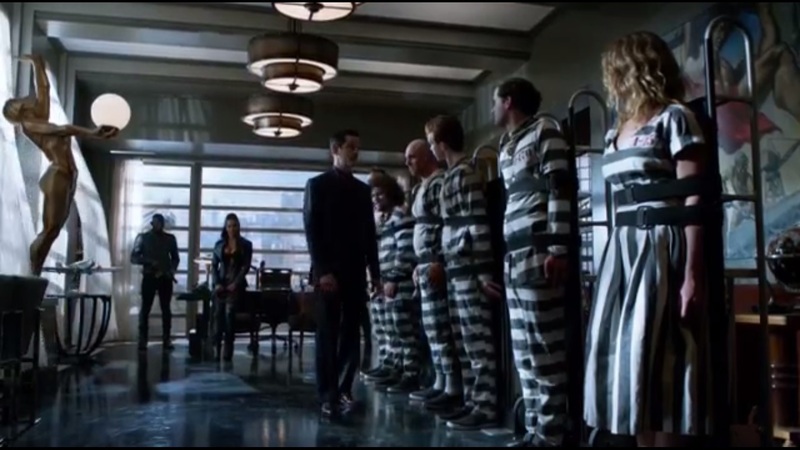 Leslie is worried, though Gordon assures her that Barbara can do no harm while locked away at Arkham. They can’t let some crazy drive them out. But why not? Because of Gordon’s pride? What’s keeping them there? Well, Gordon’s bad thing, for one. Commissioner Loeb hears some clattering at his residence and heads to the kitchen to investigate. 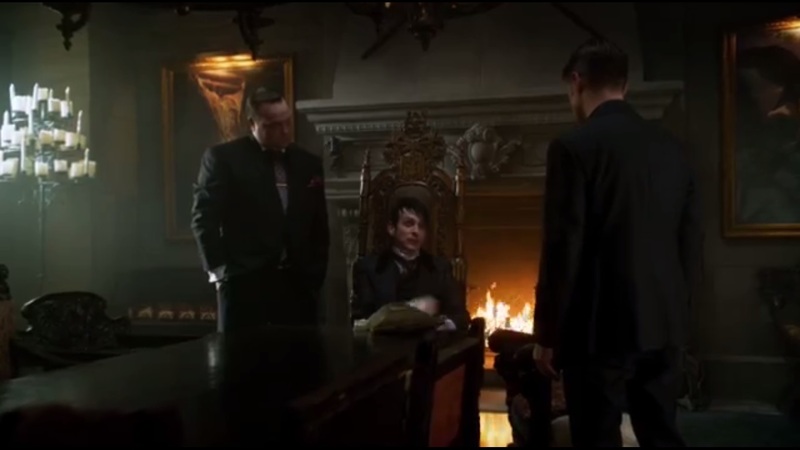 It’s here that he’s confronted by both Zsasz and Penguin. Penguin just wants some peanut butter, but it’s always about more than the peanut butter, isn’t it? 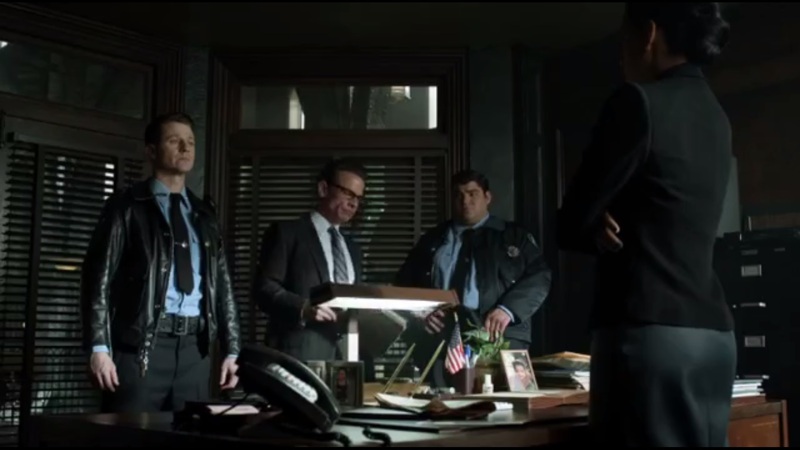 Loeb can’t get help from his guards since Zsasz has killed them, which is a bit of a setback. Penguin shares his dilemma and how he needs Loeb’s help, but this will be a challenge. With most people, Penguin can find a weak spot and use violence or blackmail to persuade them to doing his bidding. Loeb, though, has no vices. The only rational option would be to kill Loeb, which Zsasz very much wants to do. When Loeb agrees to reinstate Jim as a detective, Oswald senses that it’s not sincere since Loeb could turn at any moment. Following this, we cut to a ceremony that is also Loeb’s farewell. Who gives the address? 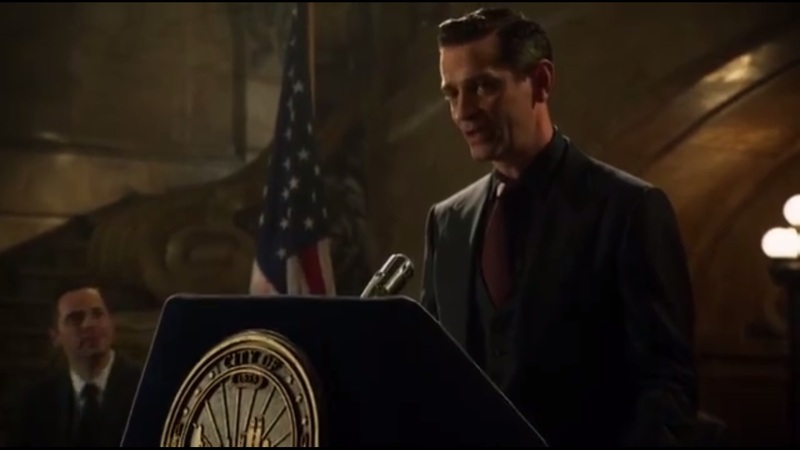 The new Chairman of Development at the Gotham Chamber of Commerce: Theo Galavan, played by James Frain. 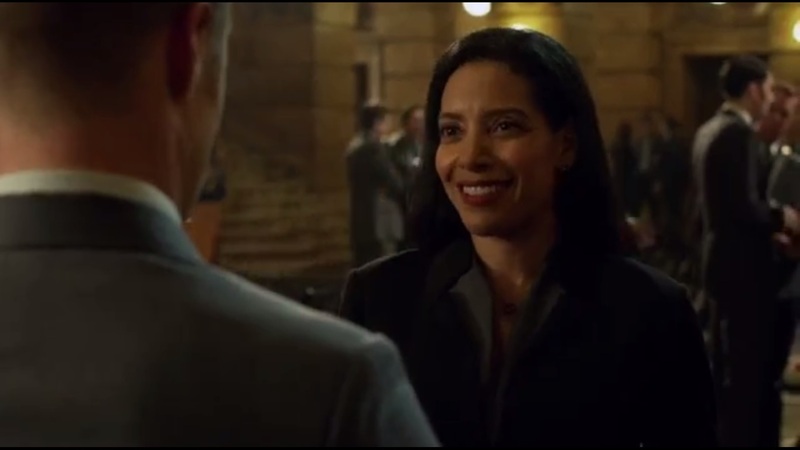 Galavan is new to Gotham, but he loves the city. It grabs a hold of you. When Loeb takes the stage, he gives his best wishes to the new Commissioner, Sarah Essen. At Arkham, Zaardon arrives to little fanfare, even when he demands the inmates surrender their souls or feast on pain. He coughs up smoke again, knocking out the inmates. At the same time, a woman and two others blow into Arkham and kill some guards in the process. Back at the ceremony, Commissioner Essen gives Jim his badge. She has no idea how he pulled this off, but she’s glad. It’s a new day in Gotham. Leslie hopes that whatever Jim did was worth all this. Essen soon learns that there’s been an incident at Arkham and six inmates, Barbara included, have been freed. The inmates are brought before Theo Galavan and the woman who freed them, his sister Tabitha, played by Jessica Lucas. Today, Galavan says, is the first day of a wonderful future. The world sees these people as criminal lunatics, but he sees brilliance, charisma, power. Imagine a world where inmates are picked for their ability and work as a team. Gotham would tremble before them. Barbara points out that she’s not an outlaw- she just as issues. You know, like poor writing and characterization. But Theo sees ferocity and beauty in her, and that’s enough. Richard Sionis, though, isn’t on board with this team since he’s not one to take orders. That and he’s got the hots for Barbara. He can pay Galavan as soon as he’s back on the streets, but Theo isn’t interested in money or sexual jealousy. 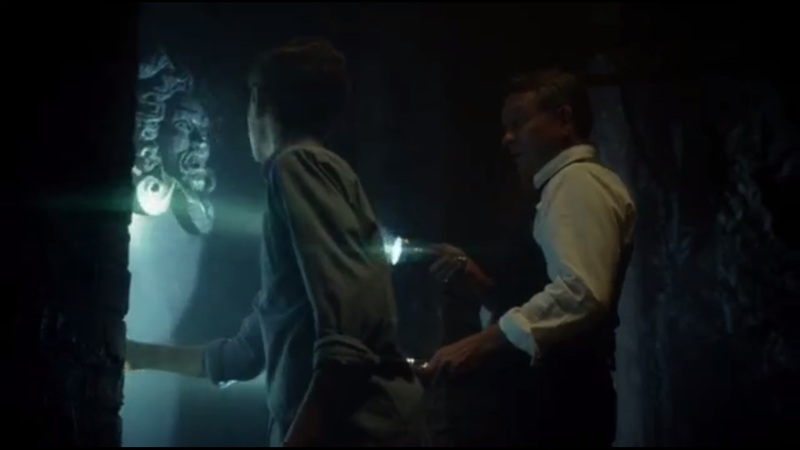 Alfred and Bruce manage to blow open the door with their makeshift bomb and enter the hidden cave. On a decrepit work station sits a note to Bruce from Thomas Wayne. 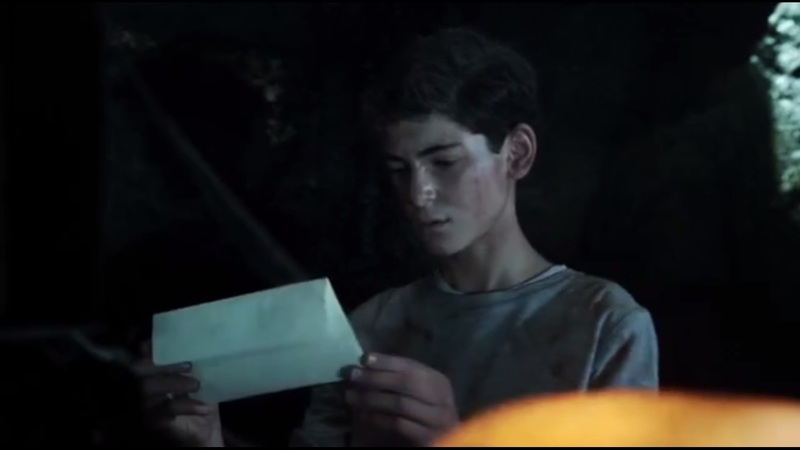 First off, the code to the door was “BRUCE.” My guess was “PEG.” This hidden place exists because of Bruce. The last few weeks up until Thomas wrote this letter were mortal. Thomas has no idea what his son is like now, but he hopes that he becomes a good man. He has a bit of advice: Bruce can’t have happiness and the truth. He must choose. He advises his son to choose happiness unless he feels a calling…a true calling. So, Season Two gets off to a bit of a quicker start than last year and I appreciate that. There are problems, no doubt, but this episode looks like it wants to kick things off with a bang and capitalize on this “Rise of the Villains” storyline. There at least appears to have been some consequence due to the end of last season. With Falcone, Fish, and Maroni gone, Penguin is left to rule the crime world, though no word on his club yet. The work seems to have driven Bullock into a simpler life, which is a nice change of pace because he’s happy with where he is. It makes me wonder whether this will be a permanent progression of his character arc or if the show will try and return things to the status quo. As is, I like the idea of Bullock turning in his badge and gun, even though there are probably plenty of times where he could have done so before this. And he’s still able to be Jim’s voice of reason, a twist on their relationship, but also following up on Bullock’s words that doing favors for criminals can just lead to trouble. Which makes me wonder whether Gordon has learned anything at all. He’s been down this road many times before: when you make a deal with Penguin, you’re going to get your hands dirty. This is Gordon still early in his journey and while he wants to clean Gotham up, I’ll give the writers credit for not making him a 100 percent idealist. He had Delaware at his mercy last season and now he’s committed murder. In self-defense, sure, but with Gordon crossing this line, he’s once again indebted to Penguin while trying to cover up his less than legal actions. But at the very least I’m glad that, for the most part, we’re not retreading familiar territory with the Gordon versus Loeb storyline. I mean, there’s still the matter of Miriam, so I assume Gordon still has leverage there, but instead of just reminding Loeb of that, he relies on Penguin. I don’t have as much of an issue with this as I could because Penguin’s influence stretches far and I could believe he could get Loeb to resign. So at least this Gordon/Loeb dynamic hopefully won’t stretch out again. Plus, didn’t Gordon hand the Wayne murder investigation over to Montoya and Allen? So why is he apologizing to Bruce? Now onto the rogues. 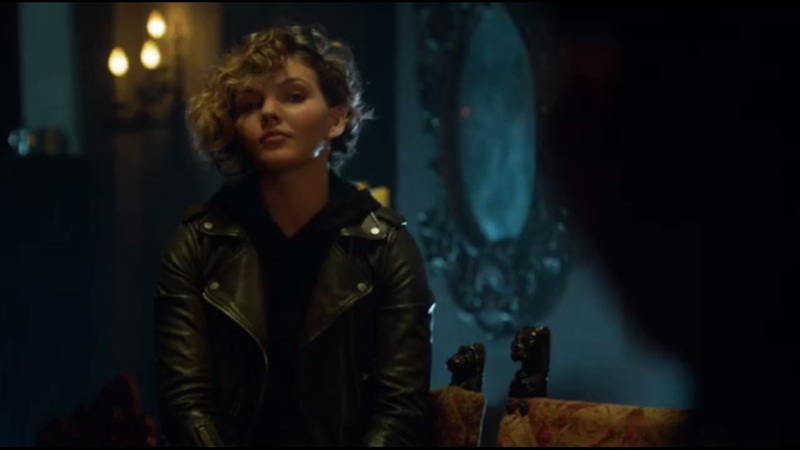 Again, it’s fine that Gotham wants to get things moving fast, but I wouldn’t have minded seeing more time spent in Arkham, especially since Barbara just got there. Again, how she’s able to be in the same space as the men is one thing, but I’m guessing Arkham Asylum doesn’t have any money in their budget for separate gender wings. While I’m still not a fan of Barbara as a character, I’ll say that crazy Barbara is a bit more bearable than dull Barbara. It’s a minor step forward, because I suppose if the writers couldn’t make her a believable partner for Gordon, the only logical step was to make her insane. I’d hardly call this a character progression so much as just a way to keep her around. As for Theo Galavan’s master plan, it’s interesting that he chose these six to join his quest, given that we know some of them already. I mean, what would make him want this group? Unless he’s been keeping tabs on them, I don’t see why they would stick out from any other inmates. 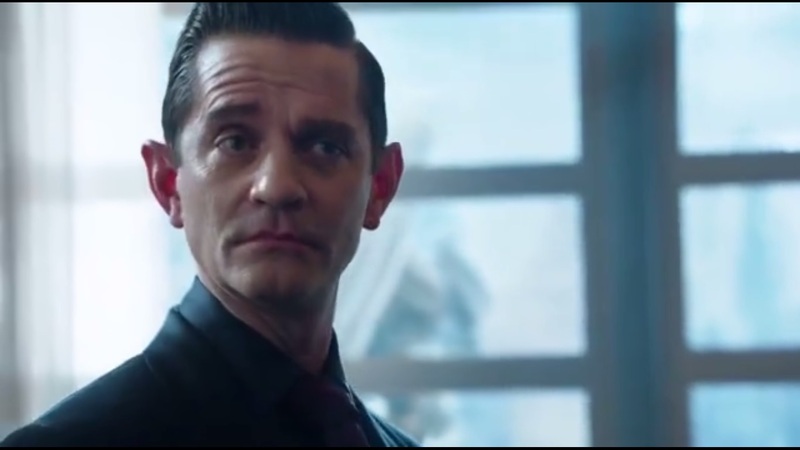 James Frain is fine in his debut. The man’s been on a roll so far this year, coming off two very good performances in Orphan Black and True Detective, so I’m interested to see how he’ll do on Gotham. 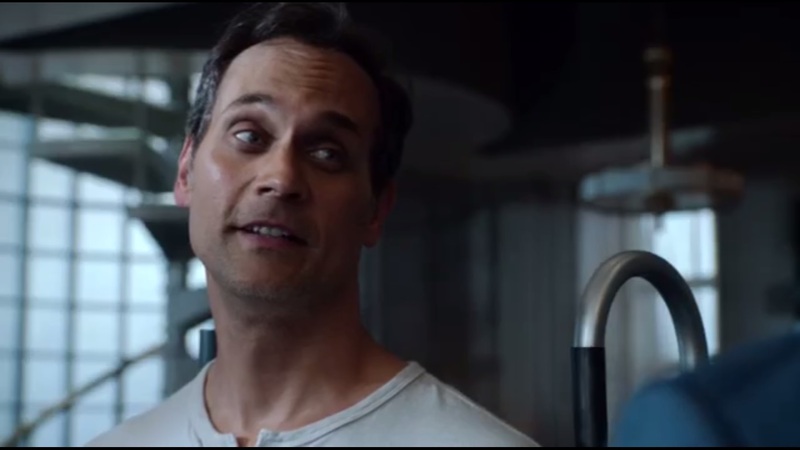 I was a bit disappointed that Todd Stashwick reprised his role as Richard Sionis, but he’s killed off in the premiere. I mean, yeah, Black Mask wasn’t the best of villains on Gotham, but if you’re gonna bring him back, do something with him. Otherwise, this could have just been anyone. 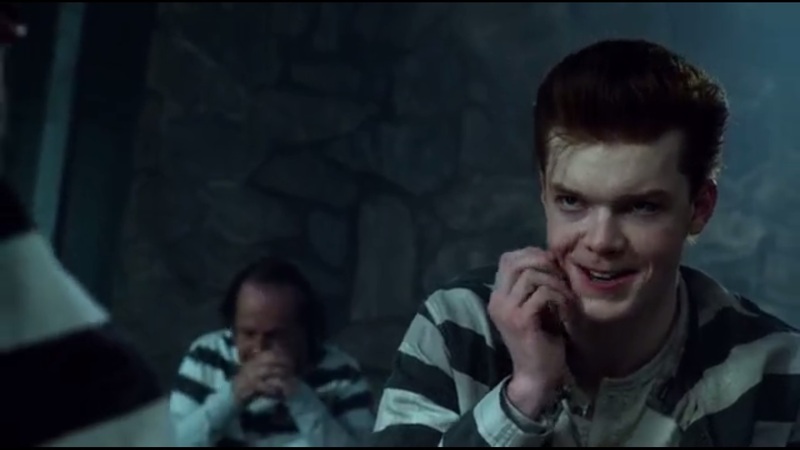 Cameron Monaghan is back and laughing it up as Jerome/Not-Joker. Would much prefer that Gotham just give us a definitive answer, rather than playing games and saying that the Joker can be idea instead of a person. Whatever. At least he brings some energy to the role. I don’t have anything to say about Selina, really. She’s just here at this point. I don’t know why she would work for Penguin, but I guess if she wants to work her way up, she needs to latch onto the next leader since Fish is gone. At least this way, maybe we won’t get any more forced adventures with her and Ivy. Yet. And her haircut isn’t as goofy as it was at the end of the first season, so there’s that. “Damned If You Do” is definitely a much stronger start than the series premiere, in my opinion. The stakes look to be much larger than last year with this not-Secret Society of villains and with Gotham touting this as the big thing this year, hopefully there’s some great payoff. We’re retreading familiar territory with some things like Gordon not expecting major consequences of dealing with Penguin and the tone, while not as unbalanced as the first season, could still use some work. I’m looking at that shaky-cam escape sequence. 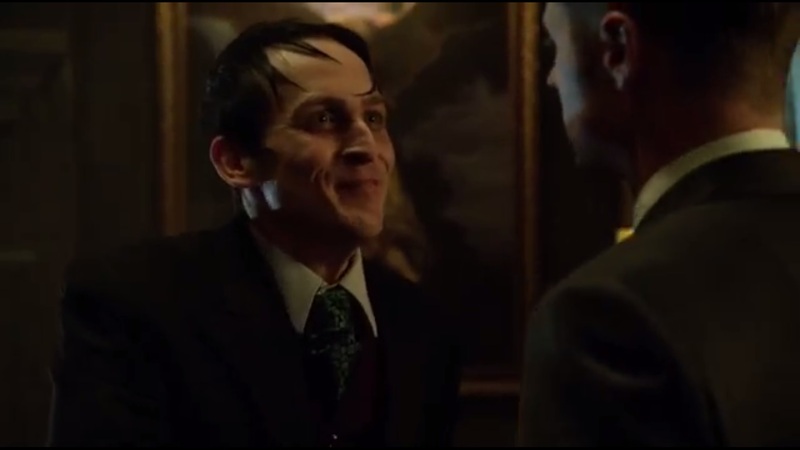 Plus, the use of Perfect Day was reminiscent of Oswald returning to a corrupt-filled Gotham and just being glad to be home. It’s meant to be ironic, but it’s a bit too obvious. Again, I want to like Gotham. The first season was a hodgepodge of trying to learn what it wanted to be and how to balance the silly from the serious. This premiere still has its camp elements, but focuses a bit more on the serious side. How that will fare for the rest of the season remains to be seen, but at the very least, I’m interested. Not the highest praise I can give Gotham, but there you go. This entry was posted in Gotham and tagged Aaron Helzinger, Alfred Pennyworth, Anthony Carrigan, Barbara Kean, Ben McKenzie, Black Mask, Bruce Wayne, Bruno Heller, Butch Gilzean, Cameron Monaghan, Camren Bicondova, Commissioner Loeb, Cory Michael Smith, Danny Cannon, David Fierro, David Mazouz, Donal Logue, Dr. Leslie Thompkins, Drew Powell, Dustin Ybarra, Edward Nygma, Erin Richards, FOX, Gotham, Harvey Bullock, James Andrew O'Connor, James Frain, James Gordon, Jerome Valeska, Jessica Lucas, Michael Barra, Morena Baccarin, Officer Franks, Oswald Cobblepot, Penguin, Peter Scolari, Richard Sionis, Robert Greenwood, Robin Lord Taylor, Sarah Essen, Sean Pertwee, Selina Kyle, Stink Fisher, Theo Galavan, Todd Stashwick, Tommy Bones, Victor Zsasz, Zaardon, Zabryna Guevara by omarid513. Bookmark the permalink.